It has been said that our doctrine will determine our destiny. 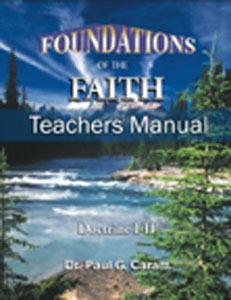 This teacher manual is based on Dr. Paul Caram’s book Foundations of the Faith. In his study of the doctrines of the Bible, Dr. Caram will explore the main doctrines upon which the Christian church is founded, giving us keys to recognizing right doctrine and how we can be transformed to be “living epistles,” having the law of God written upon our hearts.